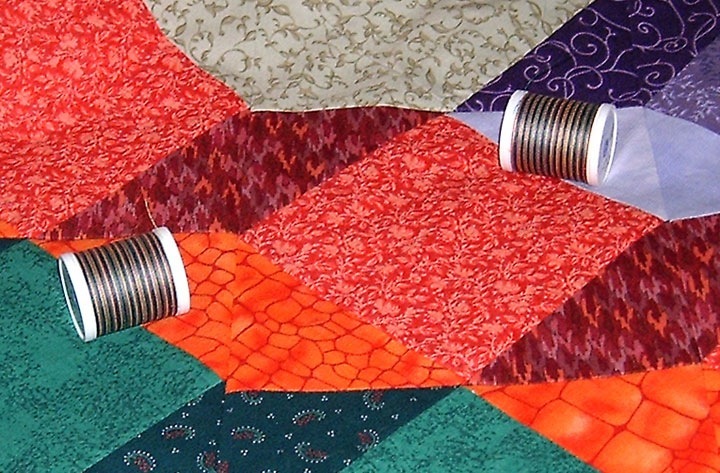 That’s always a good feeling – moving quilts from the waiting to baste to the waiting to quilt pile. Granted I ‘cheated’ and used spray baste, but they are basted! As I figured, my dad came over and wanted the quilt .. he was ready to take it down off the clips and take it with him! I said – I’m likely selling that one .. he goes – how much .. I tell him and he goes WHAT??? and offers me $10 – I just look at him, so he goes up to $25 .. I just turn my back and walk into my sewing room and start to grab bits and pieces of the material I used in the quilt .. hehehehehe .. I hand the fabric bits to him and say, here you go .. $25 worth of that quilt LMAO!!! The look on his face was priceless!!! 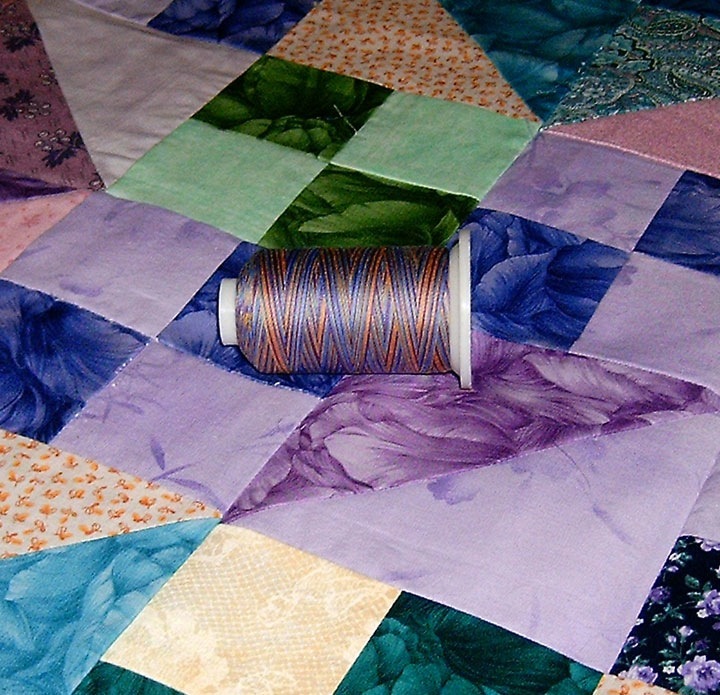 That rather ended that – for now .. we’ll see what he has to say about it when it’s quilted. Then he goes .. make them bigger .. I’m like dad, people are choking over paying $60 for a pieced and quilted baby quilt .. they are NOT going to be $300 plus for a bed quilt .. he goes .. I would .. I just look at him then look at the mystery X – yeah right! The other one I got ready for quilting is my hopscotch quilt. This was the first mystery I did last summer. 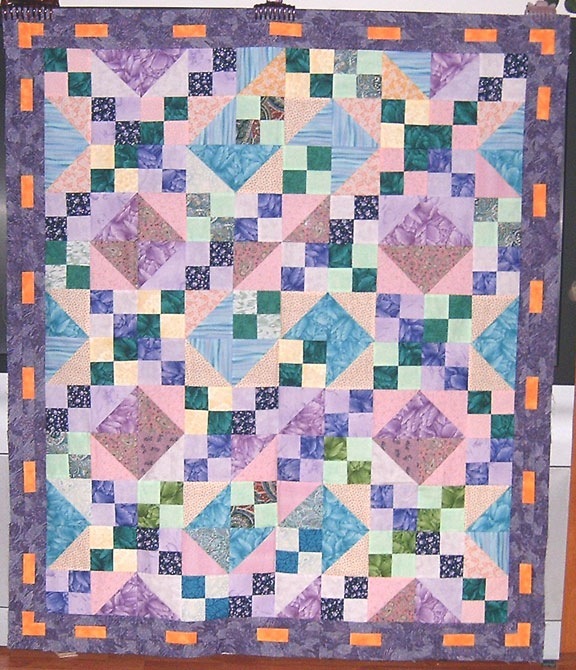 Ann Smith from Quilt Talk and Mystery Quilters (I think) wrote this one. From my thread order that came in yesterday I specifically got thread for this quilt. They all it Mediterranean and it is summery in look .. and this quilt reminds me of summer. The motif for this one was super easy .. butterflies with bees in the border .. I think .. not sure on the bee part, we’ll have to see .. I used the batting I picked up at fabricland and it’s pretty thin .. good thing this will be a summer quilt .. I’ll see if I can double this for the big fan quilt (that would have been basted too, but ran out of backing **sigh) I had already opened this one up to ‘relax’ it and was worried about shifting – I’m not sure I can double it up like that .. Then again – telling me not that I can’t do that is the quickest way to get me to do it – or at least try it. « Weather Report – Snowman Flurries? ?